The NTNU HPC-Lab is directed by Dr. Anne C. Elster and consists of her graduate students and affiliate members. The lab is part of the Dept. of Computer and Information Science (IDI) at the Norwegian University of Science and Technology (a.k.a. NTNU) in Trondheim, Norway. External colaborators/sponsors of HPC-Lab include: AMD, ARM, Atmel, CERN, Numerical Rocks, NVIDIA, SINTEF Med Tek and Statoil. PhD student Jan Christain Meyer with some of our CUDA-enabled cards! Parallell algorithms for novel architectures and accellerators including GPUs and Cell. Linear Solvers, incl. parallel approaches, and PIC particle codes. Fast linear bit-reversal algorithms and algorithms for ADSL & VDSL. HPC-Lab featured in article on digi.no Sept 21, 2012. Elster invited to give NTNU's Phyisics Dept. 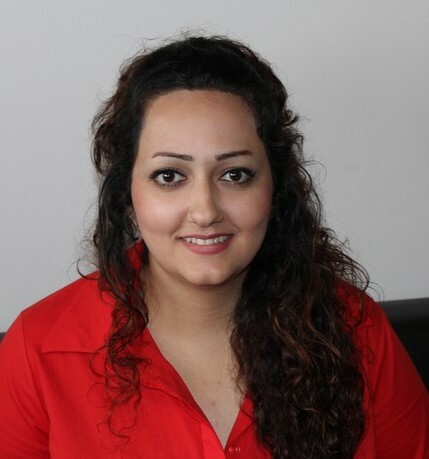 Colloquium >/a> on Sep 14, 2012: " GPU-based Simulations and Visualizations & other HPC Trends"
Samira Pakdel joins HPC-Lab this fall as a PhD applicant in heterogenous computing. 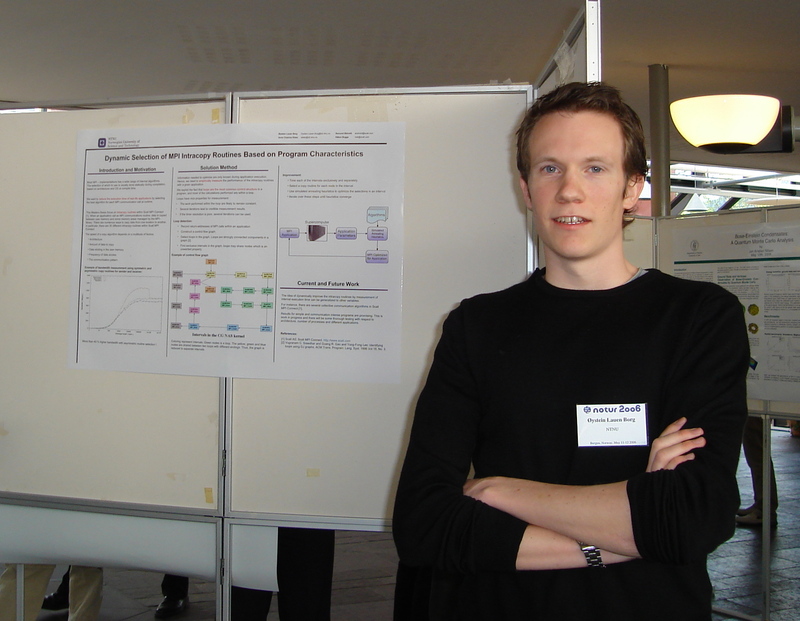 Thomas Falch joined HPC-Lab as a research asssistant and PhD applicant in July. He is supported by the Medical Computations and Visualization project Elster has with Drs. Frank Linseth and Trond Kvamsdal. Paper "Simulation of Population Dynamics P systems on CUDA" with HPC-Lab visitor Miguel Ángel Martínez Del Amor and co-authors I.PP. Hurtado, A.G. Rubio, A.C. Elster and Mario De Jesús Pérez Jiménez accepted as full paer at CMSB 2012. 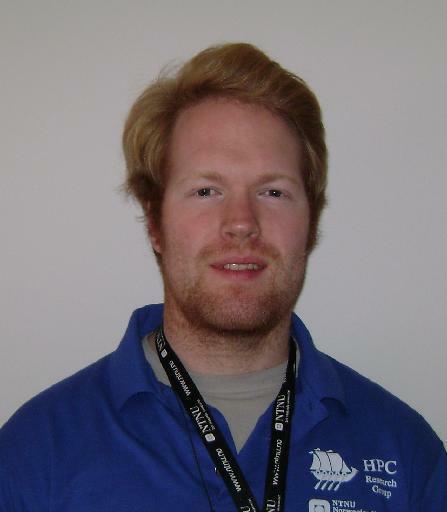 Ivar Ursin Nikolaisen joined HPC-Lab as officially as a PhD student funded by Statoil on March 29, 2012. Dr. Alf B. Rud from Statoil is his co-supervisor. 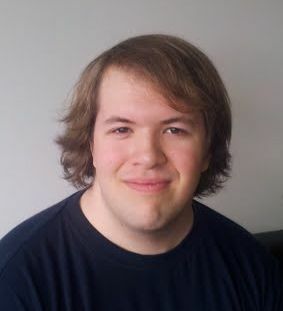 PhD student Grant Strong from Canda is visiting with HPC-Lab for the spring 2012 semester. Stop by his office in IT-vest 417 for a chat! PhD student Miguel Angel Martinez del Amor from Univ. of Seville, Sevillia, Spain, main supervisor Dr. Mario de J. Perez Jimenez, visited with us for several months in Fall 2011. Elster serving/served as Program Committee member of IEEE IPDPS 2011 (finished 12 paper reviews Nov/Dec 2010), as well as ParCo 2011, GHC'11 and SC'11 and SC'12 Tutorial Committees. Dr. Elster to give on-line invited talk on GPU Compting Research Forum , TBD. Dr. Elster served as "opponent" at PhD defence at Dept of Computer Science, U of Tromsoe, Feb 24, 2011. Giving invited seminar talk there on the next day. Elster gave 50-minute invited talk at IMA Workshop High Performance Computing and Emerging Architectures , January 10-14, 2011, Univ. of Minnesota, USA. 2 co-authored papers by HPC-Lab members presented at IEEE IPDPS 2011 (HCW and MTAAP), Anchorage, Alaska, May 2011. Thorvald Natvig defended his PhD on Dec 20, 2010 Profs. Brian Vinter(Copenhagen Univ.) and Otto Anshus (U of Tromsoe) as well as NTNU's Dr. Joern Amundsen were opponents. Rune E. Jensen received Norsk Regnesentrals pris (The NRprize) for Best master thesis in Math and ICT at NTNU 2008/2009 for his Masters thesis "Techniques and Tools for Optimizing Codes on Modern Architectures". Jury statement (in Norwegian) and photos . Elster was his thesis advisor. 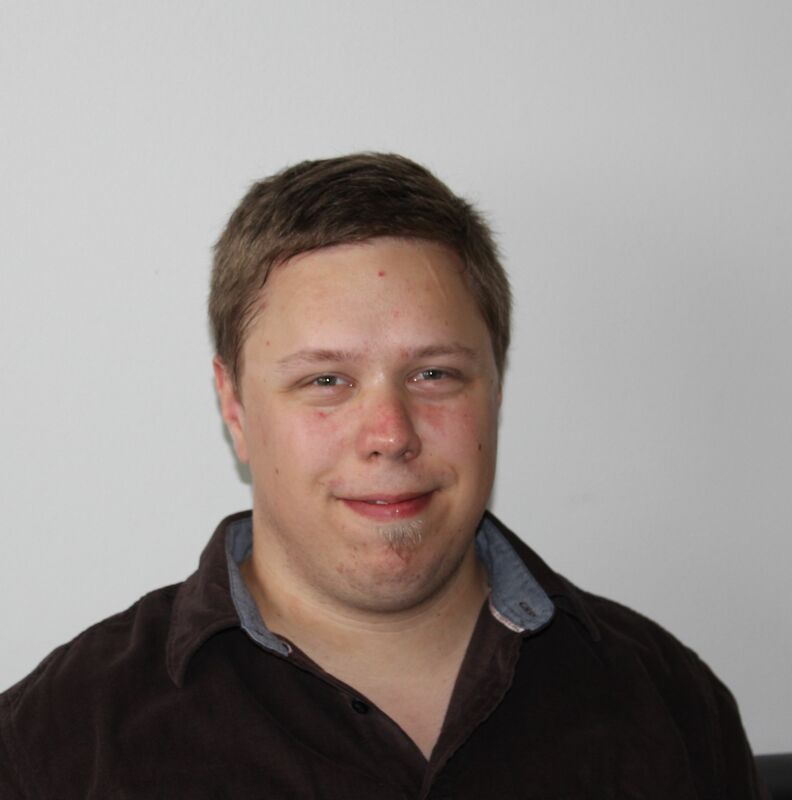 Rune is now a PhD candidate at HPC-Lab. 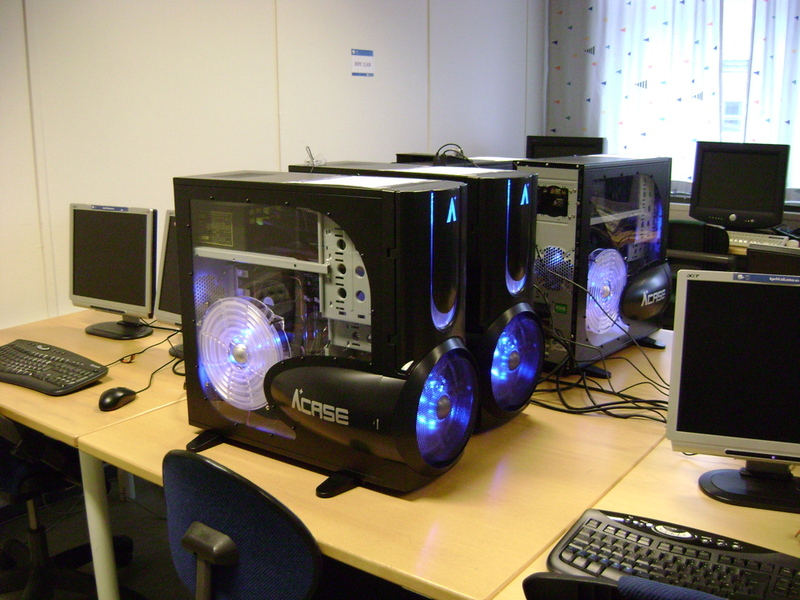 HPC-LAB has several custom-made multi-core workstations with high-end graphics cards donated by NVIDIA through Dr. Elster being part of their Professor Partnership Program. 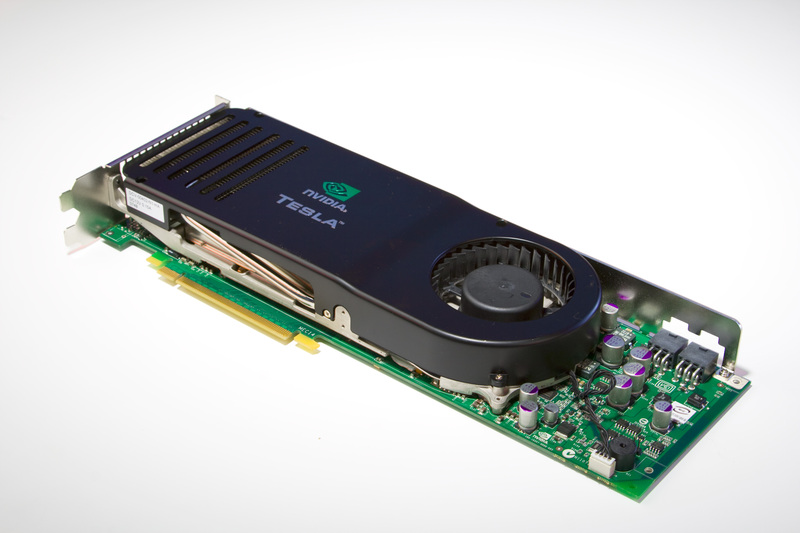 These include several NVIDIA Quadro and Telsa cards. 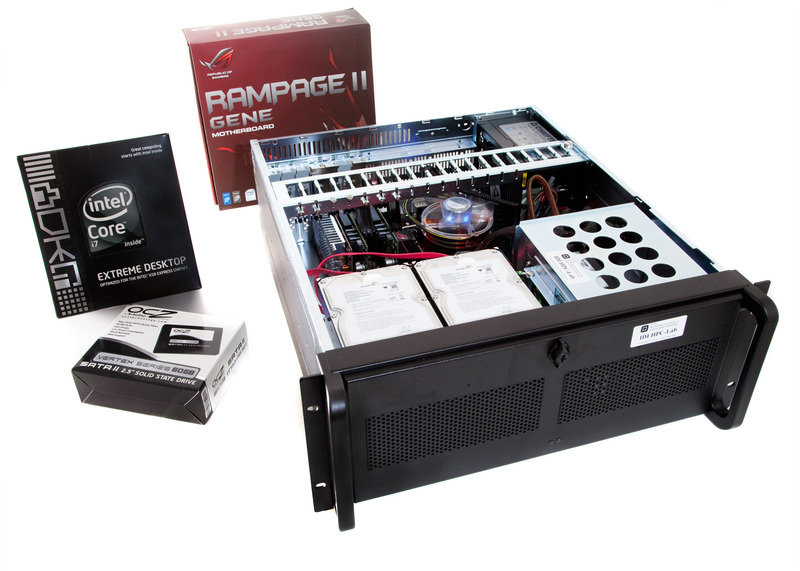 We recently also purchased and two Fermi Tesla cards (c2050 and c2070) from NVIDIA through their "Mad Scientist" program, as well as a GeForce GTX 470 card. AMD donated a 5870 card to our group for our SC'09 stand and we have two other AMD ATI Radon cards (5850 and 5870). HPC-Lab received a Zotac ION board donated by NVIDIA on June 3, 2009. 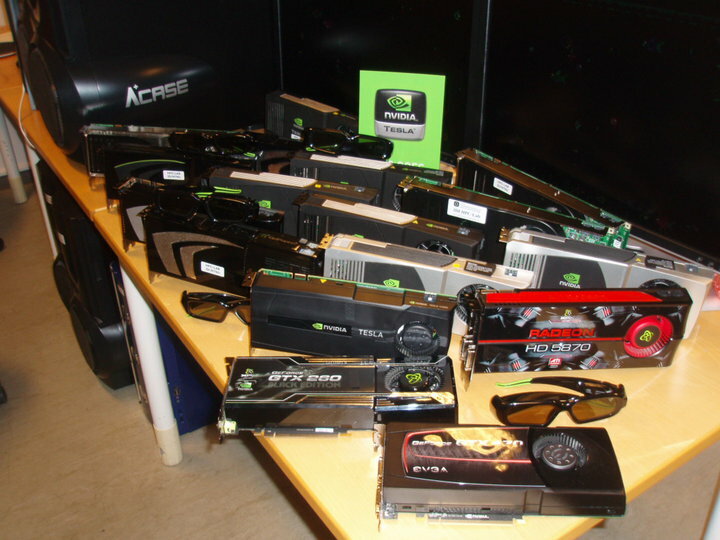 It was one of 10 such boards donated through NVIDIA's Professor Partnership program. The Dept. of Computer and Info. 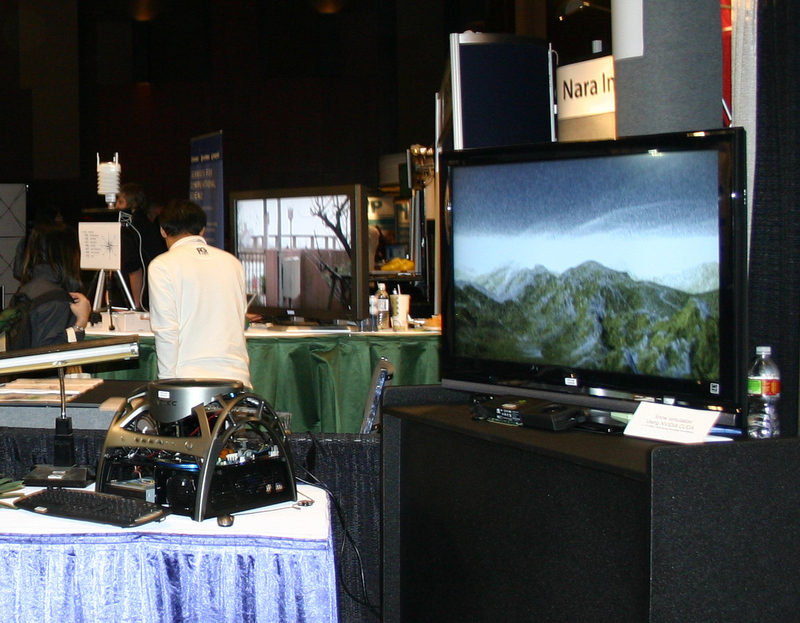 Science also recently provided us funding for several more high-end PCs for fall 2010. It also purchased a 9-node dual quad-core HP cluster which is used by Elster's TDT 4200 Parallel Computing course and by HPC-Lab members. The cluster was installed Spring 2010. 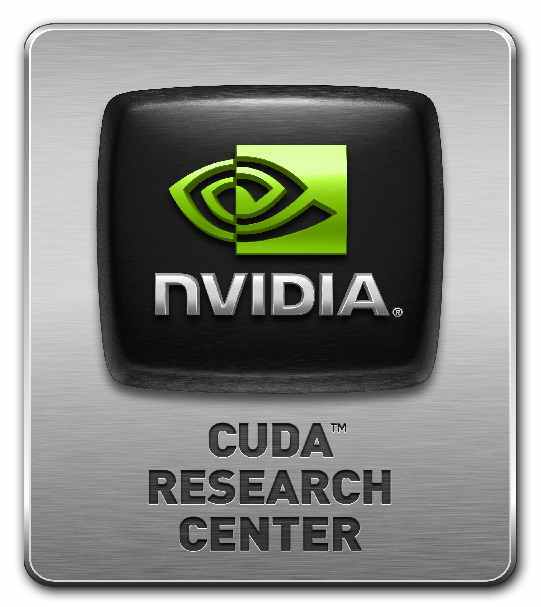 Link to interesting article: "CUDA, Supercomputing for the Masses:Part 1" by Rob Faber, April 2008. 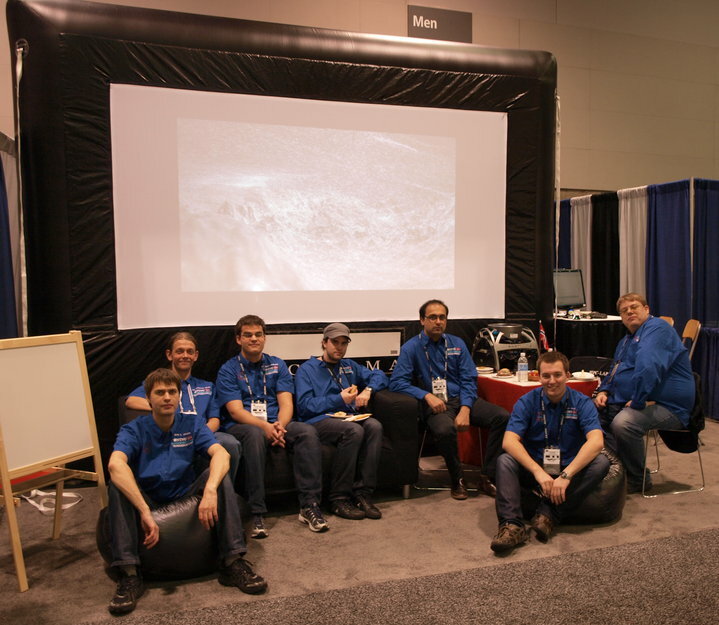 Several HPC-lab people helped gather most of our GPU cards for this photo ..
How do you like our 3meter tall inflatable screen for 3D HD projection? Geir Josten Lien (Master of Science, IDI) "Auto-tunable GPU BLAS"
Kjetil Babington (Master of Tech., IDI) "Combining Several Data Sources and Rendering Techniques for the HPC-Lab Snow Simulator"
Thomas Falch (Master of Tech., IDI) "3D Visualization of X-ray Diffraction Data"
Jan Rovde (Master of Tech., IDI) "Real-time Granular Flow Simulation Using the PCISPH Method on GPGPU Devices Using CUDA"
Frederik MJ Vestre (Master of Tech., IDI) "Enhancing and Porting the HPC-Lab Snow Simulator to OpenCL on Mobile Platforms"
Dr. Elster finished her Ph.D. in Electrical Engineering at Cornell University in 1994. She joined NTNU in January 2001. See Dr. Elster's bio for further details. Jan Christian will be teaching Dr. Elster's courses TDT 24 and TDT 4200 in Fall 2010 and TDT 4205 and PhD course DT 8117 Grid Technology and Heterogenous Computing in spring 2011 while she is on sabbatical in the US. Master Thesis title: "Load-Balancing Visualization Servers" co-supervized with Dan Vasaru, Schlumberger VoxelVision. Mr. Meyer was on exchange to Estonia in 2001/2002. He worked for the NOTUR Cluster project on emerging technologies fall 2003. 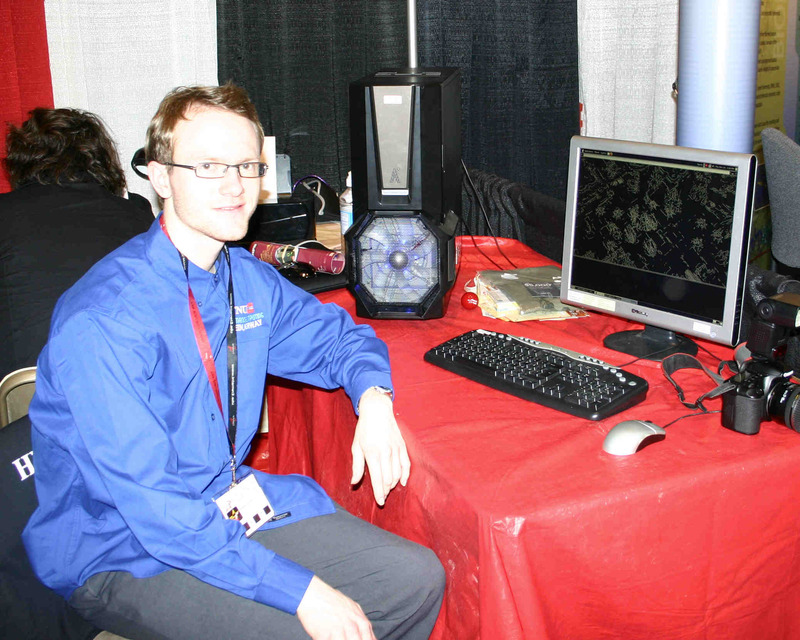 He finished his MS thesis Summer 2004 and worked (until Feb. 2006) as a staff member at NTNUs HPC facility as well as our Dept. 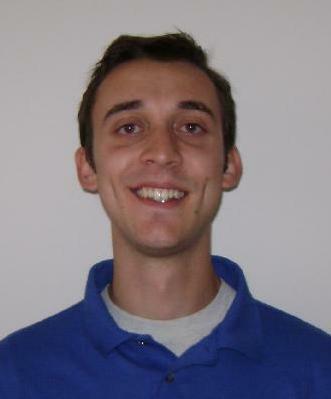 He joined Elster's research group as a Ph.D.-track student Feb 1, 2006, and had booth duties at SC'07, SC'09 and ISC'10. 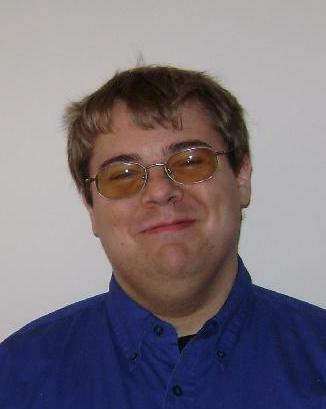 He was the TA for TDT4205 Compiler technologies taught by Elster in Fall 2006-2008 and spring 2010, and was the TA for Elster's TDT 4200 Parallel Computing course, spring 2006-2009 as well as fall 2009. 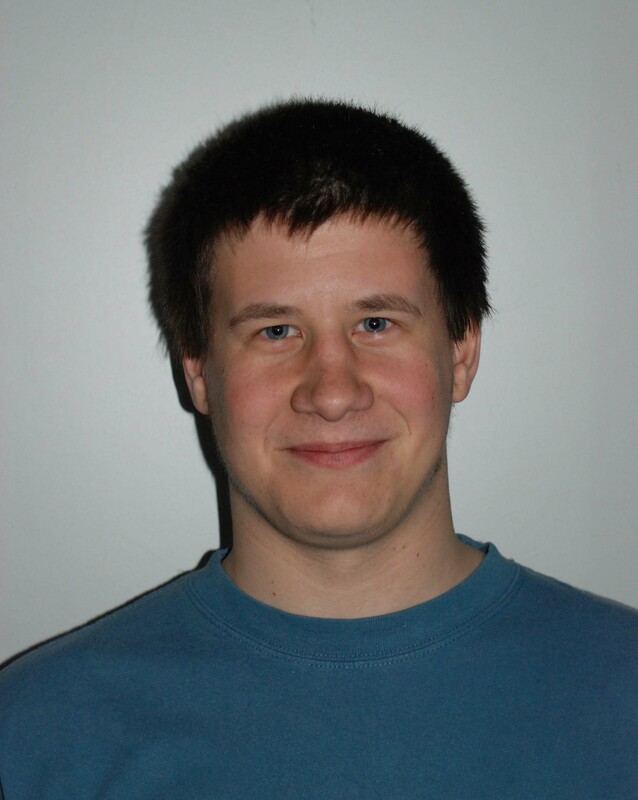 Masters thesis: "Data visualization in parallel environment by using the OpenGL standard"
Dr. Perhác joined HPC-Lab for 12 months starting mid-April 2010 as an ERCIM Post Doc. At CERN until Sept 2009 and worked at QQ2S optimizing hashing codes for encryption before joining the HPC group again as a PhD student recently. As of fall 2010 he is also conintuing his Q2S work part-time. 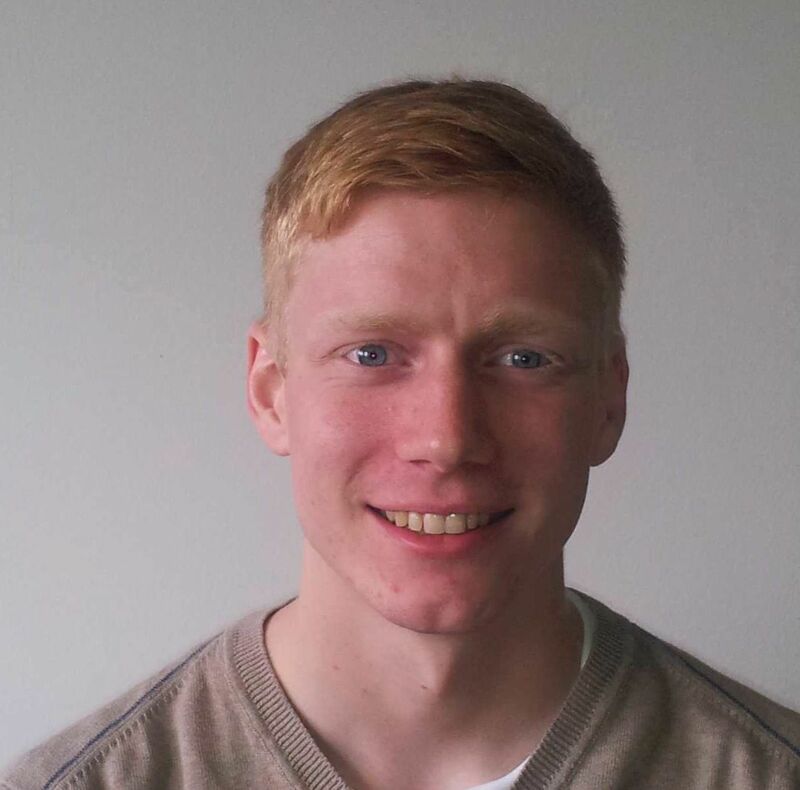 Geir joined is this January and will be doing the 2-yr Master of Science degree. 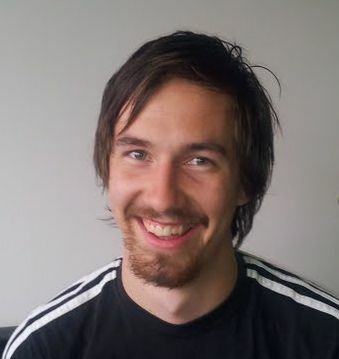 There is a hope Eirik Ola will continue with his PhD at NTNU later this fall. or in 2011. Dr. Amundsen holds a Ph.D. in Mathematical Sciences with Prof. Syvert Nørsett as his advisor. 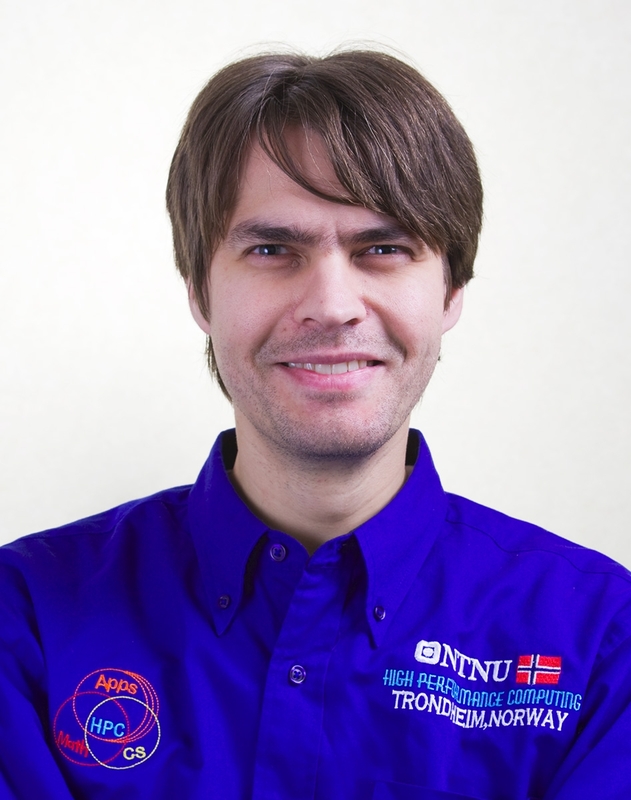 In addition to his duties as an adjunct faculty member of Computer Science, he is a staff member in the HPC group at NTNU's Computing Center . He taught "Intro to Computer Science" (IT grunnkurs) to 800 students in Fall 2006. In addition, he served as Dr. Elster's replacement while she was on maternity and research leaves Fall 2004 thru 2005. 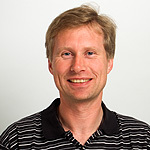 As part of those duties, he helped chair the organization of the SIMS 2005 conference that was held at NTNU in October 2005 and is the co-editor of its proceedings. is working in the field of medical image processing and visualization. He also holds a position as a Senior Research Scientist at SINTEF Medical Technology working in the field of Image Guided Interventions / Surgical Navigation within the National Center for 3D Ultrasound in Surgery, a unique collaboration between surgeons (from St. Olav University Hospital and NTNU) and engineers (from SINTEF and NTNU) in Trondheim, Norway. Elster and Lindseth co-supervise several graduate students. 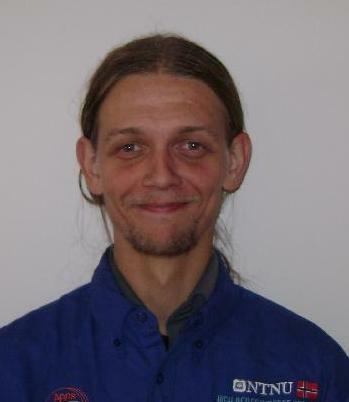 He was a Post Doc with Dr. Elster 2005-2007 and is currently a Researcher at NNTNU's Computing Center (IT-drift) in their HPC-group. 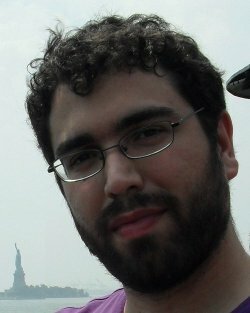 His research focus is on using grid technology to integrate visualization and computations. Dr. Nagel also helped out with the organization of the SIMS 2005 conference that was held at NTNU in October 2005 and is the co-editor of its proceedings. Spent junior year on exchange to UCSB"
ParCo 2009 paper "Modeling Multi-GPU Systems" (PDF pre-print for personal use) by Daniele G. Spampinato, Anne C. Elster and Thorvald Natvig (all from NTNU, Norway). Dr. Elster gave invited talk on "Optimizing Codes for OpenCl and CUDA" at INFORMS 2010, Austin, TX, Nov.7, 2010. Thorvald Natvig presented work with Elster on "Run-Time Analysis and Instrumentation for Communication Overlap Potential" at EuroMPI2010, Sept 12-15. 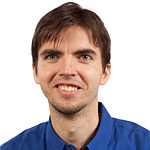 "Integrated MS/PhD" student Erik Smistad joins HPC lab. 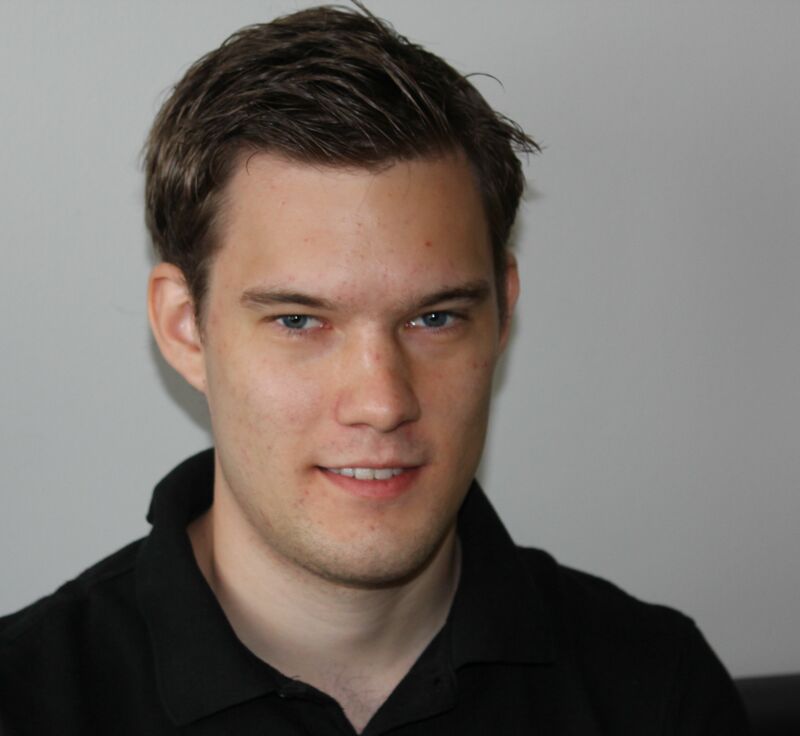 Main advisor: Frank Lindseth, co-advisor Elster. Master students Aleksander Gjermundsen and Andreas Hysing turned in their theses in July and August, respectivly. 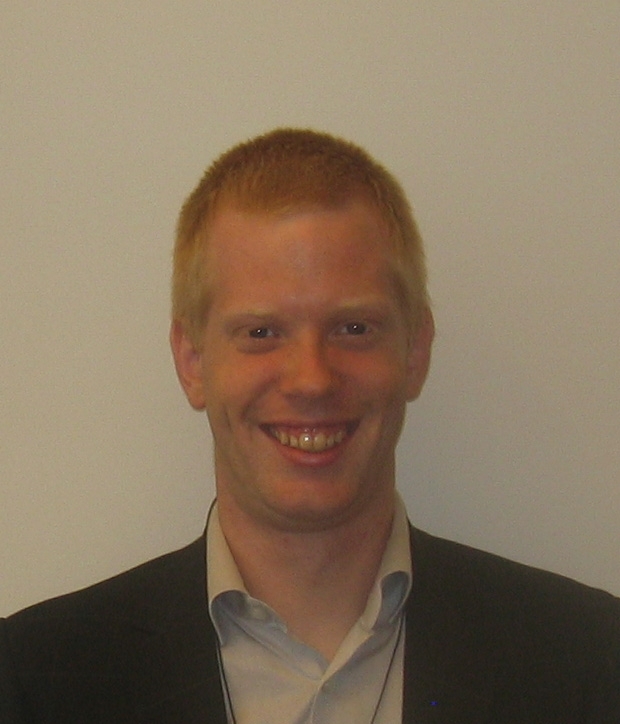 HPC-lab member Thorvald Natvig turned in his PhD thesis for external review on June 30, 2010. Master students Ahmed Aqrawi, Øystein Krog and Holger Ludvigsen turned in their theses in June! Dr. Elster gave 10-15 min talk on HPC in Norway during opening session at CCP 2010 on June 23, 2010. Dr. Elster gave invited talk on "Computational Physics on GPUs" at CCP 2010 on June 23, 2010. Polish graduate students Krystyna Napierala and Jarek Palczynski from Poznan, Polen are visiting HPC-Lab June 21-23, 2010. 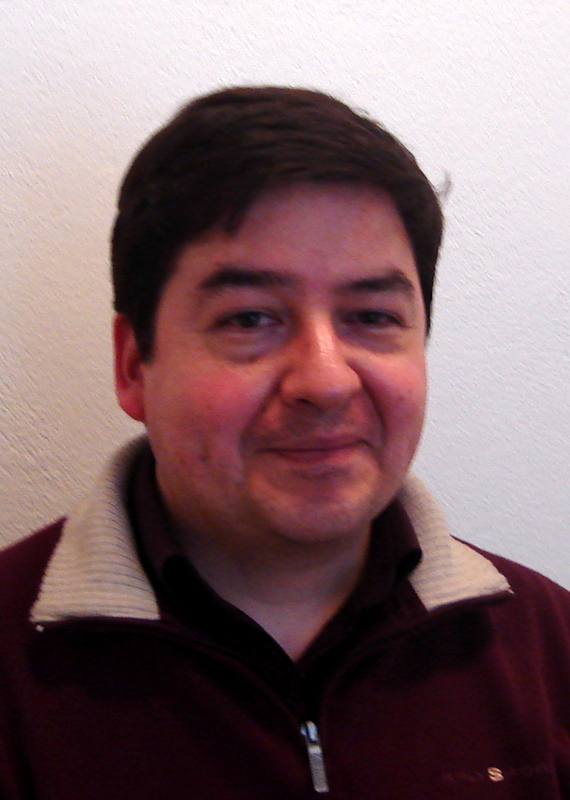 Dr. Elster organized MS on GPU Computing/EuroGPU 2010 at PARA 2010 in June. Included talks from tests on our Fermi cards NVIDIA Tesla c2050 and 470cards! HPC-Lab had a succesful stand at ISC 2010 in Hamburg, June 1-2. Holger Ludvigsen and Anne Elster gave short-paper "Real-Time Ray Tracing Using NVIDIA OptiX" at EuroGraphics in Norrköping, May 3-7, 2010. 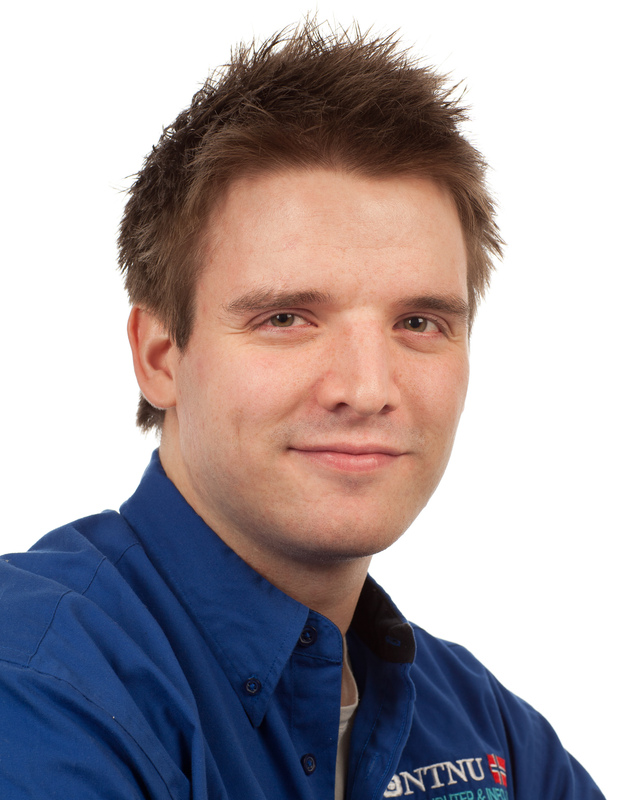 Dr. Ján Perhác joined HPC-Lab as ERCIM Post Doc in April 2010! Elster, Meyer, Natvig and R. Jensen participated at the IME MultiPro/Embedded Selbu Workshop December 2009. 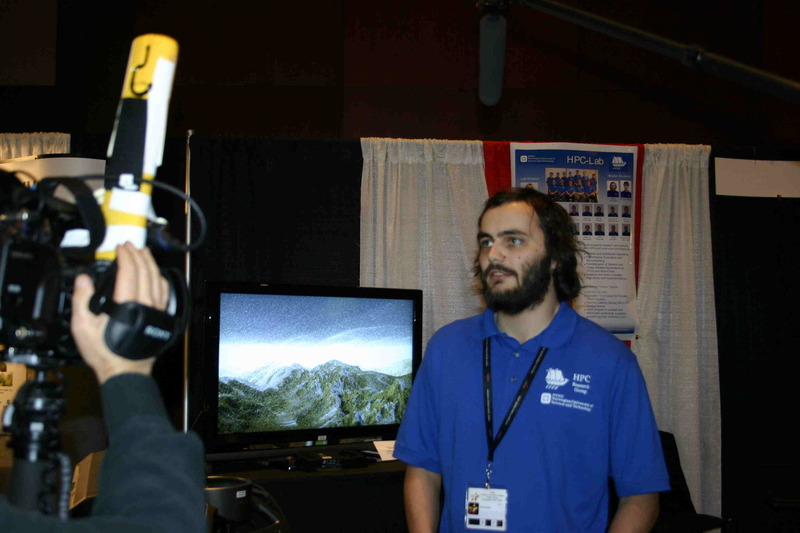 HPC-Lab had a successful stand at SC'09! 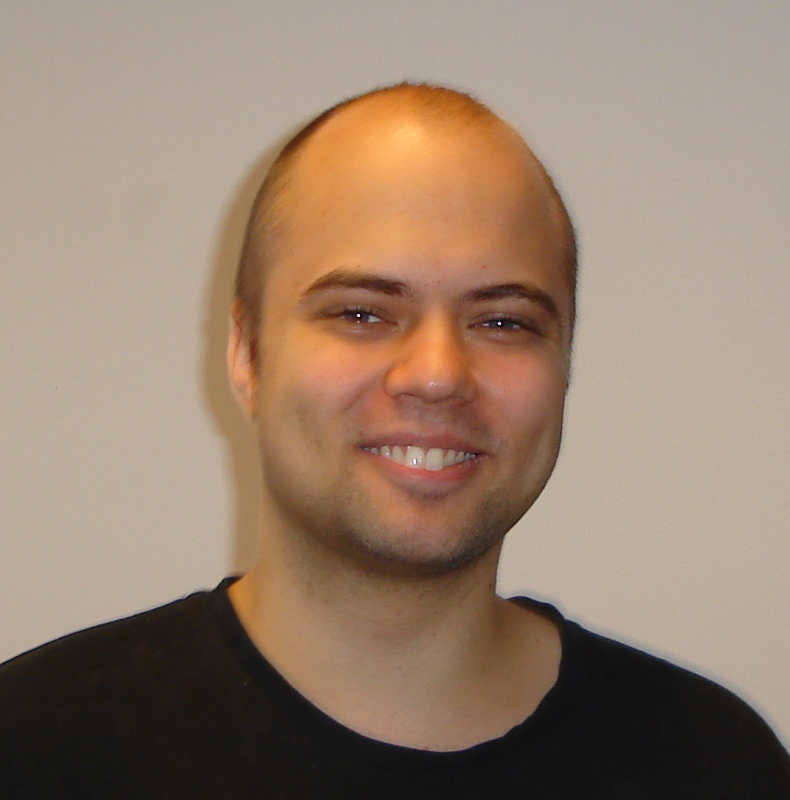 HPC-Lab graduate Rune E. Jensen receives 2008/2009 Norwegian Computing Center Master Thesis Awards. Link. Elster gave two talks at EU COST meeting in Lisbon on ComplexHPC. List of talks with links to presentation slides. Dr. Elster gave invited GPU talk at PPAM 2009, in Poland, Sept.13-16, 2009. link to Abstract and PDF of slides. Dr. Elster co-organized GPU Minisymposium ParCo'09 in Lyon, France, Sept. 1-4, 2009. 12 talks + panel incl. 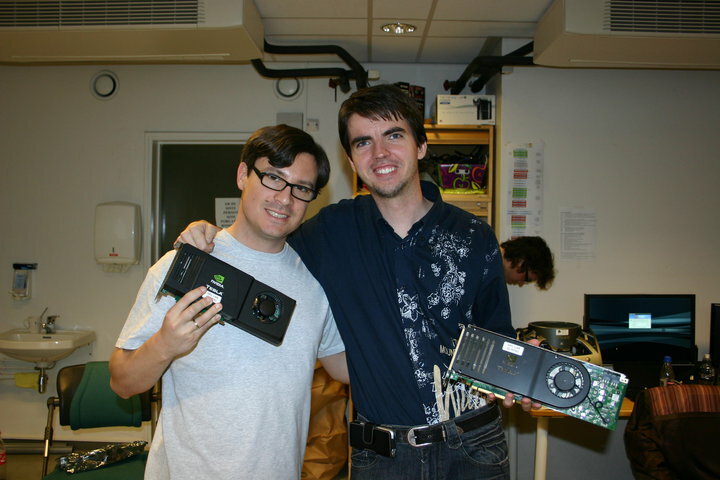 Tim Lanfear (NVIDIA) and Rune Jensen (CERN). 3 talks by HPC-Lab members (Elster, Aksnes and Spampinato), plus mini-talk by Rune Jensen on his CERN work. 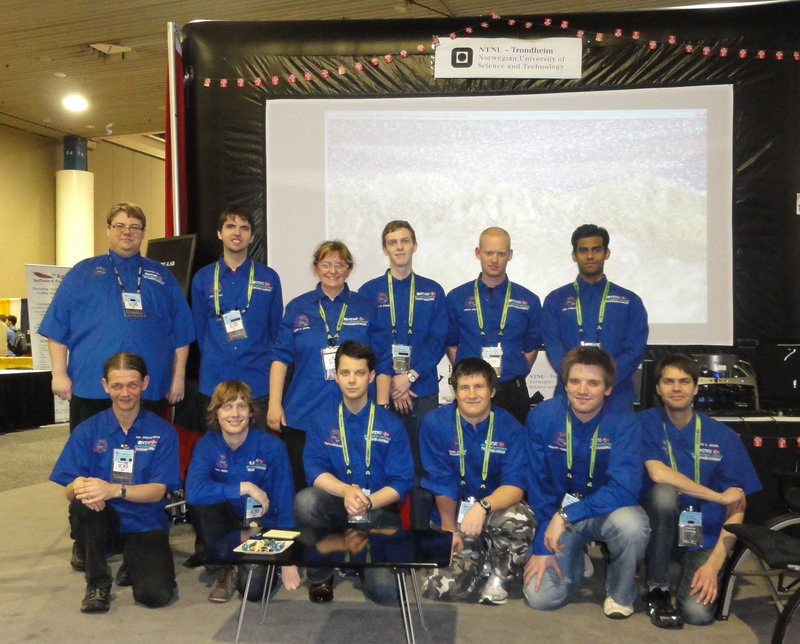 9 Masters students graduated from HPC lab in 2009. See above for current members including several new incomming master students -- including students from Mathematical Sciences and Applied Cybernetics! June 3, 2009: Zotac ION board donated by NVIDIA arrives. 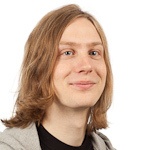 HPC-Lab project student Åsumund Eldhuset gave this year's IME graduation speech. 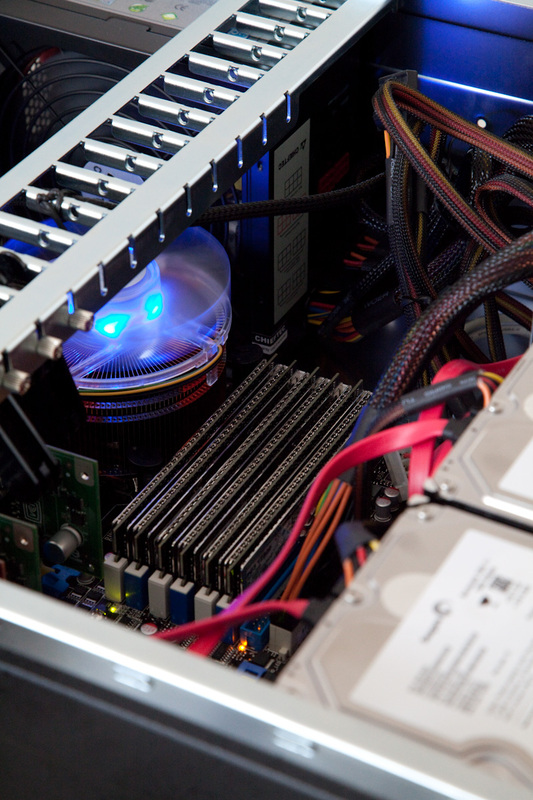 Elster quoted in "GPU Computing is about massive data parallelism", InfoWorld, Jan 22, 2009. 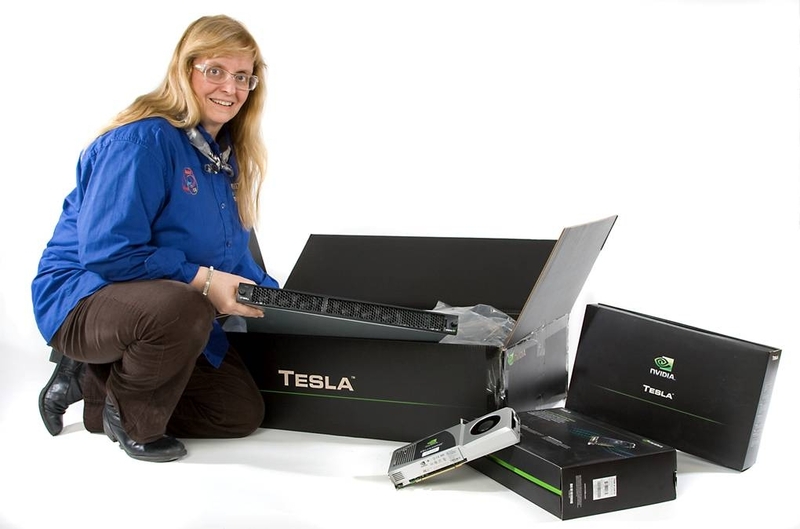 January 2009: NVIDIA donates more equipment to our lab including two Quadro FX 5800 and a Tesla s1070! Dr. Elster gave a presentation the NVIDIA event in London Dec 4. Robin Eidissen and Elster gave poster at SC'08: "Comparing Cg and CUDA Implementations of Selected Transform Algorithms"
HPC-LAB had a nice booth at SC'08. The event drew a record 11 000+ attendees! 8 master students and 1 PhD student attended in addition to Dr. Elster, who was Co-Chair for Posters. 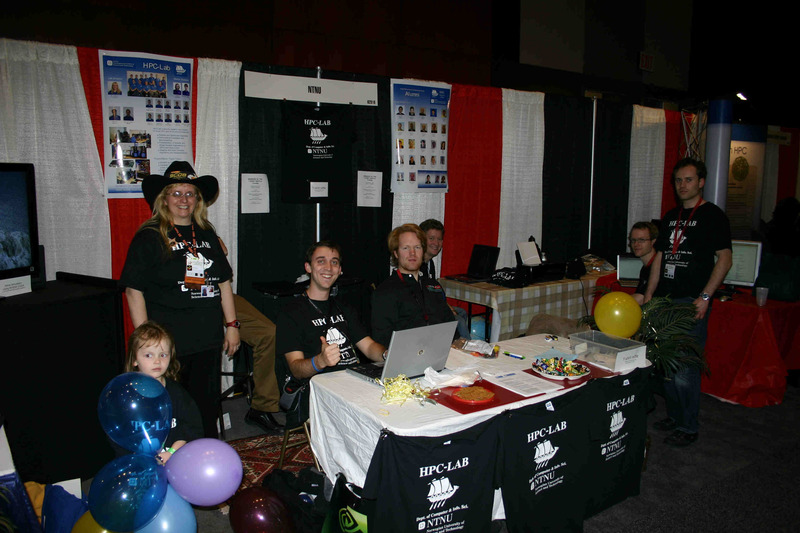 NOTUR and the IO Center also had booths this year. 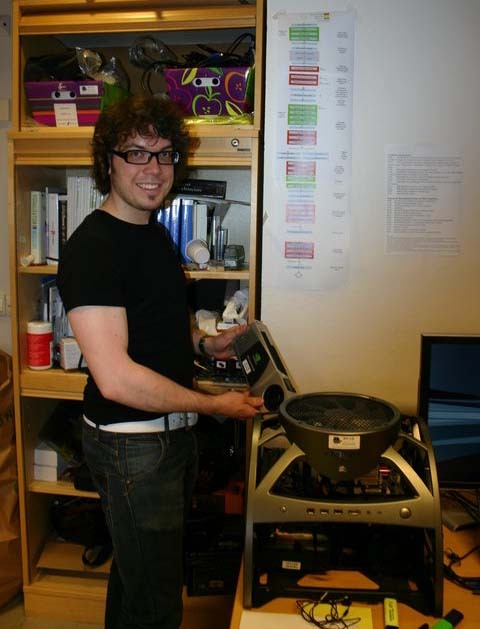 Erik Axel Nielsen's MS Thesis work on using the GPU to speed up image processing (filtering) is making it into the next generation cardio ultrasound equipment from GE Healthcare. 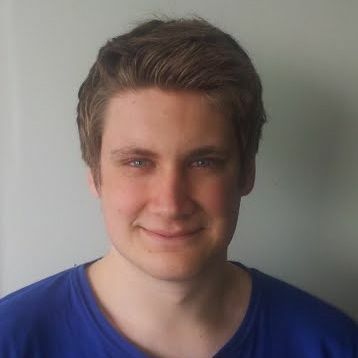 Erik Axel Nielsen's Master thesis work with Elster on using GPUs for the Wavelet transform for processing cardiac ultrasound images sped these up by a factor of 40 making real-time processing possible. This work has already made it into GE Healthcare's high-end cardiac ultrasound scanner product. This project was a joint effort by NTNU, U of Bergen, U of Oslo, U of Tromsø and UNINETT. Statoil, Norwegian Meteorogical Institute (met.no) and UNINETT will also be participating. Elster helped raise NOK 1 million at NTNU for these projects, which made us the largest partner. These funds were mached by the Research Council of Norway (RCN) which also added in NOK 450K for expanded storage Harware that was installed at NTNUs HPC facilty for the use of Met.no. The projects ran through 2004. Several of her students were involved in the GRID and cluster subprojects. Elster also got some of her colleagues at IDI involved in the storage subproject. 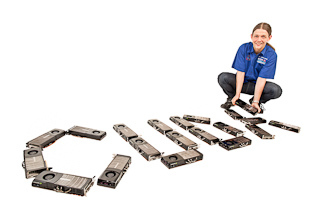 Look at emerging cluster technologies for Norwegian HPC users. 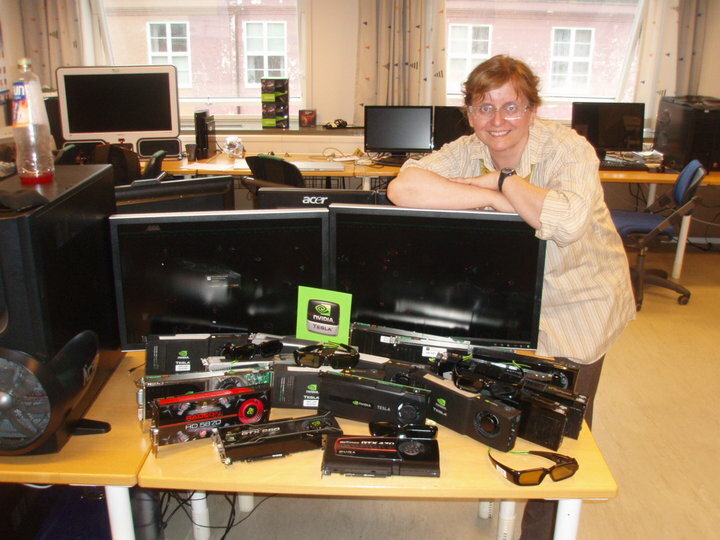 Ph.D. student Thorvald Natvig building and configuring our new high-end front-end for our new NVIDIA s1070. The images are "clickable" and all taken by Dr. Elster and IDI photographer Kai T. Dragland. 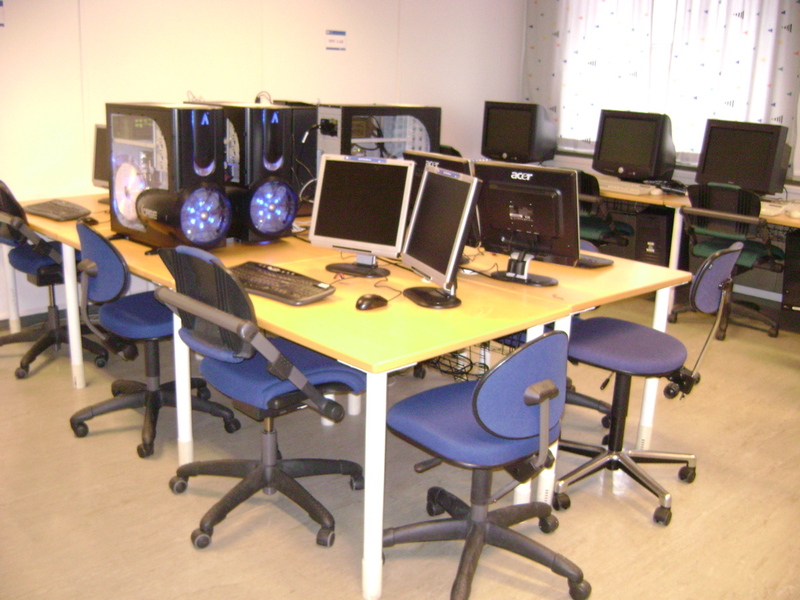 One of the first photos of the lab -- right before its opening in Oct 2008. 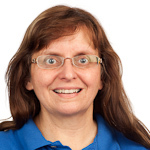 This page is maintained by : HPC-Lab leader Dr. Anne C. Elster, elster-at-idi.ntnu.no. All photos are done and copyrighted by her. Please contact her if you wish to use them. It was last updated on Aug 30, 2010. Comments welcome.